I am very excited today to share something I have been working on in secret for the past few weeks along with the help from some lovely testers! 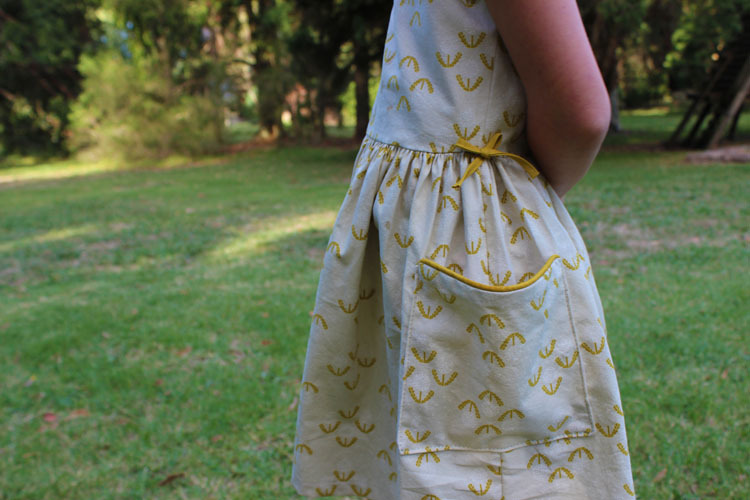 I am releasing my first pattern under my new label of 'sewpony' (no longer, sewpony vintage), The Dulcie dress...and guess what...it's free! There has been a lot going on behind the scenes at sewpony...this is the first of many exciting things I am sharing with you. Please stay tuned every Friday for the next month as I show you more and more of some fun sewing inspiration and goodness! I will be opening my new sewpony shop next week with updated existing patterns as well as some other surprises! 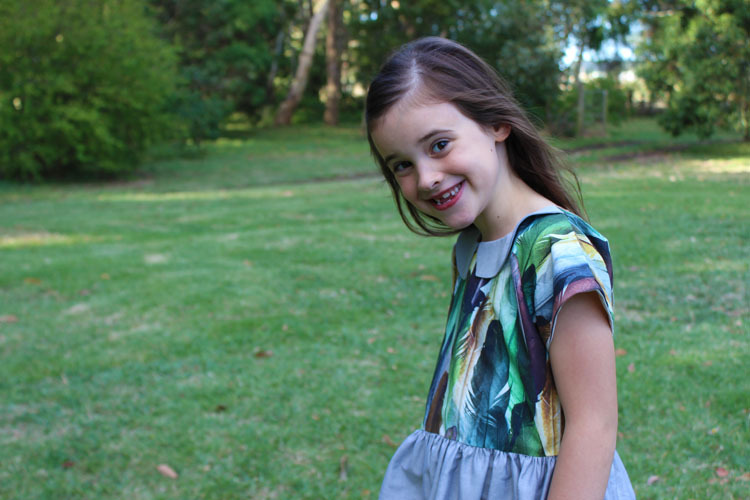 The Dulcie dress is a simple and easy wearing dress. It features dolman sleeves which can be made short or slightly longer with turn up cuff and buttons. Do you love piping? Add it to the shoulder seams and pockets. Dulcie is a high waisted dress and features a square or round neck line at the front. A half pointed collar can also be added to the rounded neckline. The skirt is gathered and features optional piped patch pockets. The back has a rounded neckline and closes with an invisible zip. Add little decorative bows at the bodice/skirt side seams for fun. 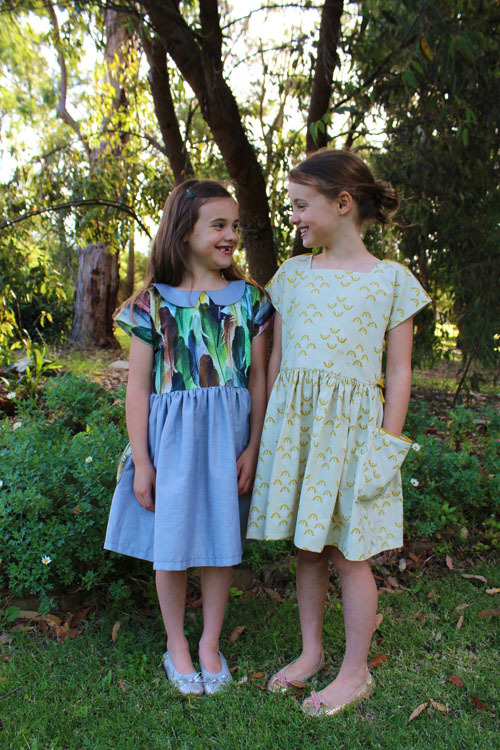 A relatively quick sew, you will want to sew more than just one! Suitable for woven fabrics. Some details about the Dulcies my girls are wearing...Isabella wears a square neck Dulcie with piped shoulder seams and pockets and some sweet little bows at the side seams. Fabric is by Rashida Coleman Hale for Cotton and Steel from Hawthorne Threads. This colour way is no longer available, but the blue colour way is equally stunning. 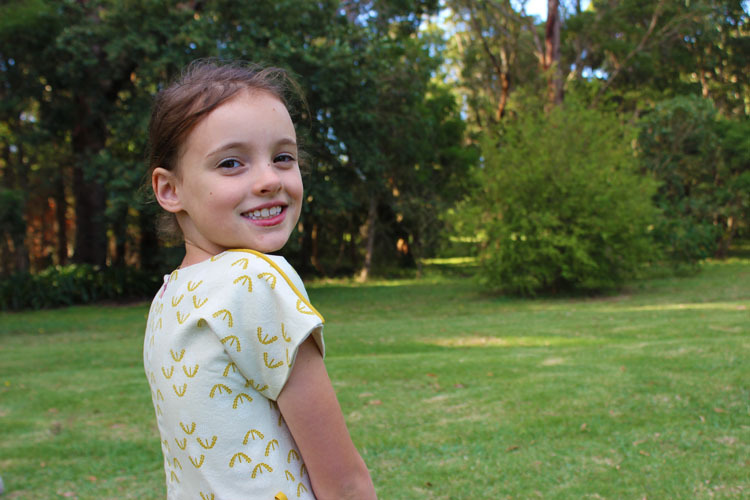 Juliette wears a round neck Dulcie with half collar and plain pockets. 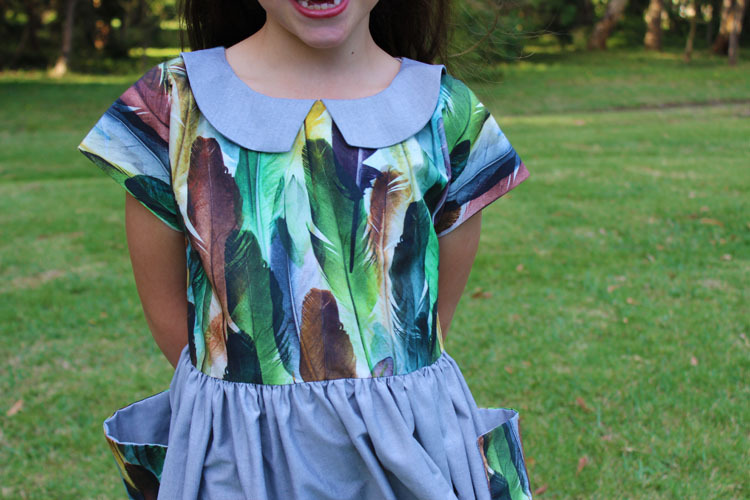 The bodice and pocket fabric is the divine Wolf and Rita Feathers fabric from Mon Depot in Belgium (a kind gift from the lovely An of StraightGrain). The skirt is a soft brushed grey cotton from Spotlight. I love that Dulcie offers sleeves without technically having to add sleeves (my least favourite part of sewing dresses!). See some of the tester versions on IG for more Dulcie inspiration. Speaking of testers, a big thank you to my secret posse of enthusiastic sewers! Thank you An, Anke, Emi, Iris, Jenya, Miranda, Nelleke, Renee and Zoe! And an extra special thank you to Jenya from While she was sleeping, for her thorough proof reading and enthusiasm for this project! 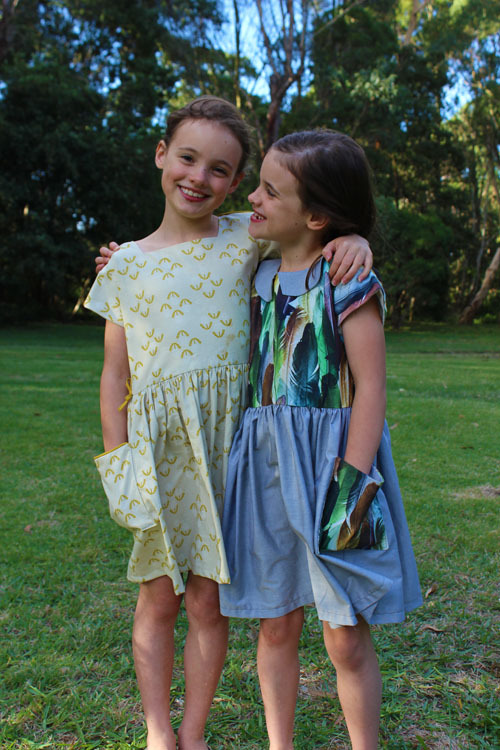 Search and tag your dress with #dulcie dress and #sewponypatterns on social media to connect with other sewers from around the world!! You can also now share photos in the new sewpony patterns facebook group here!! 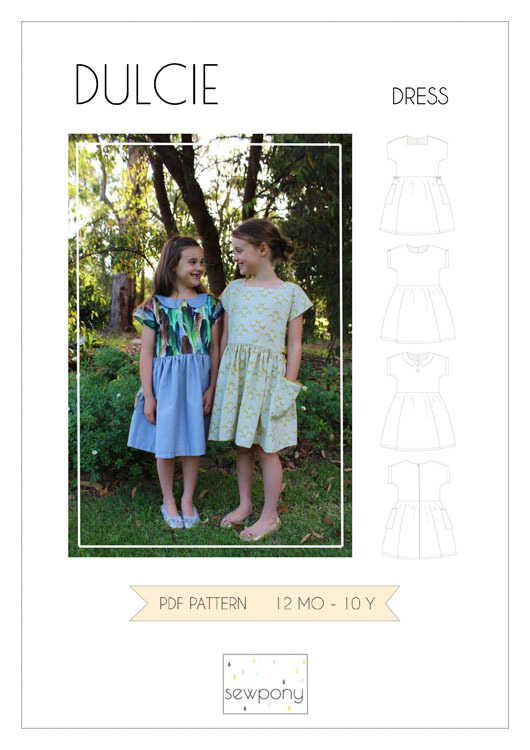 So go ahead and get sewing your first Dulcie dress! I hope you will love it! Thank you for this gorgeous free pattern! Cannot wait to see what is coming! Hi, I can't find the download either. Hurray! I loved reading this post because it makes me feel your happiness and excitement! I love your patterns but I've not received any welcome email after subscribing... where can I download this gorgeous pattern? Er loopt precies iets mis ...ik kan op geen enkele manier aan dit gratis patroontje geraken. Zou het nochtans voor kleindochter willen maken voor haar eerste schooldag. Hoe kom ik er alsnog aan,aub? I can't download the pattern and I don't have FB. Hi there. I subscribed to your email but didn't get the pattern. Wondering what I did wrong. Thank you SO much for this offer! So pretty! Can't wait to try it out! I plan to sew it up as soon as I get the pattern and hit the fabric store for the goods to make it. Hi Suz, I just found this page and just joined. I hope you have a try at making a dress for my grand daughter age 3. I cannot seem to down load the free pattern, but I have been browsing your others, and hope you procure some of those in the future. I have some fabrics that would be perfect for this dress! Thanks a lot for your free pattern. 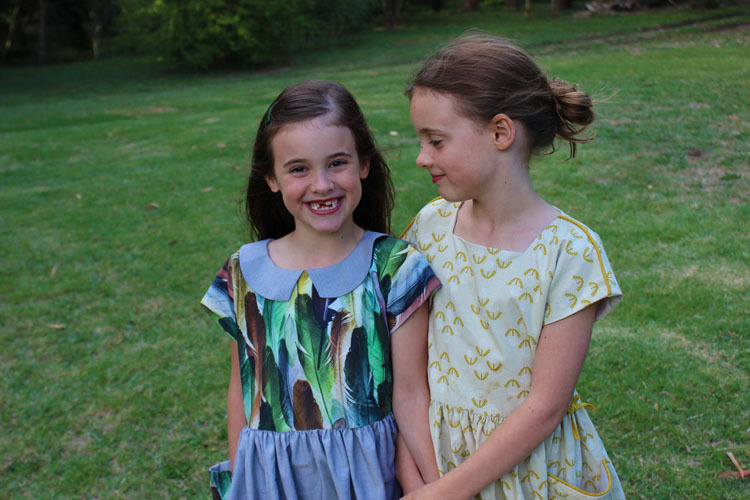 I sewed the dulcie dress and it is just soo lovely!